Director of Teacher Education & SCERT, Odisha, Bhubaneswar Published Admission Notification for Different Teacher Training Courses (i.e D.El.ED (C.T) , B.Ed, B.H.Ed, M.Ed, M.Phil) for the Session 2019-20. Online Application Will Start from 1st April 2019. Director of Teacher Education & SCERT, Odisha, Bhubaneswar is Conducting A Separate Entrance Exam in Every Year for Admission in to Different Teacher Courses. Qualified Candidates will be eligible for Admission in to Different Teacher Course Programmers for the year 2019-2020. 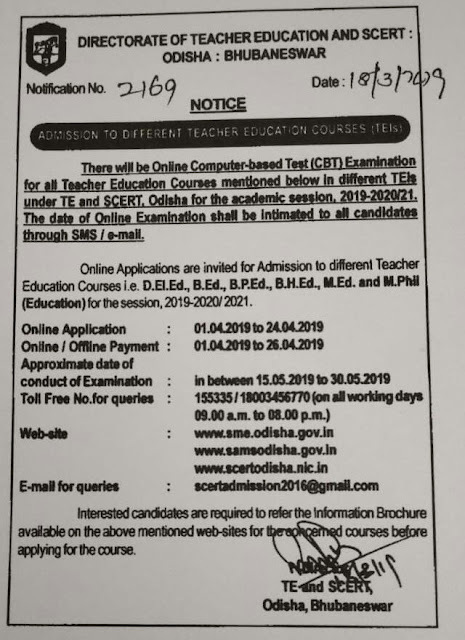 ODISHA D.El.Ed ( C.T ) B.Ed Admission Notice 2019-20 Out. SCERT Odisha Will Publish Notification for C.T B.Ed Courses. After that Candidates Can Apply through Online Mode. Candidates Can Apply through SCERT Website. All Candidates are Requested to Go through Details Notification Then Apply. Online Exam Date & Admit Card Will Notified Through Officil Website, Email/SMS. Qualification for B.Ed/ B.H.Ed / M. Ed / M.Phil Courses. 1. +3 Arts/Science or B.Tech having Science/Math Specialization with 50% Mark (i.e 45% for Reserve Categories. 2. +3 Arts with Hindi as a subject. 3. B.Ed, B.A, B.Sc, Qualification needed for M.Ed Courses. 4. M.A(Education)/ M.Ed Qualification needed for M.Phil Courses. Candidates Can Apply through Official Website. For More Details and Query Comment Your Query Bellow..
hey you are eligible for CT Exam.. See last Year Cutoff from Our Website. Dear Sir/madam, can u suggest me in which date BED 2016 form fill up will be star. Sir, I have qualified my +2 Arts(upasastri) in a sanskrit college. can I alligible for CT ? sir, i have qualified my b.sc 48%. can i eligible for b.ed in this year. 50% mark required for Gen/OBC Candidates. I am a Diploma Holder & it is equivalent of +2 can i fill up the from of CT exam . i have Bsc. degree i want to know the age limit of MEd and whether i eligible for the MEd entrance or not. Is it compulsory to do BEd before applying for MEd ? If one has completed BA with PG in IRPM, can one directly apply for MEd? Yes B.Ed is Necessary because its Master in Education Course. yes you can apply and after that you are eligble for both TET & CTET. it need 50% mark for obc and gen category..
sir my +2mark is 43% and i am from sc catogory can i eligible for ct entrance 2016 or not? 45% Required for Reserve Category. Hindi as a subject in arts is necessary to apply for b.ed?? no only for B.H.ed it required hindi as a subject. for General B.Ed it required simply graduation 50% mark. Sir when will the notification about B.ed form release?pls say if it already released..
will out this month keep preparing..
sir i have qualified BCA with 65% and also qualified MCA with 76% I am very interested in teaching line i want to apply for BED.Can i eligible for BED course? for Odisha BED Course it required graduation degree but you can apply for KVS, NCERT, Novadaya PGT Computer Sc teacher. you are eligible for that exam..
if you have graduation degree with 50% mark then you are eligible for Odisha BED Cources. may be but not sure.. SCERT Will decide it. Sir for bed admission 50% marks required in honors or aggregate? I have score 51% in honors and 49.78% in aggregate. I am eligible for bed or not. 50% marks required in Aggregate. can you please tell,what is the exact date of releasing the online application form for ct(D.EI.ED) entrance 2016??? sir i am in +2 science having 49.88% excluding 4th optional and 52.6% include 4 th optional.belongs to obc catagory.can i apply ct entrance? See this Website previous Post. Yes Your are Eligible. 50% means other than your branch paper you must be 50% marks in all math & science paper like Physics, chemistry, PSD etc..
Last time DIPLOMA qualification are not eligible for C.T EXAM. For C.T You must have +2 qualification. Hi, Can we have the details regading online application DATE for CT exam ???? Notification will Out this Month..
sir i passed BBA and have 69.80% .Am i eligible for BEd. BBA are not eligible for B.ED Exam.. You Must be +3 Science/Arts. last time B.Com graduates are not eligible.. lets see what happened this year. Sir;I'm+3 student with physics as honors. Am I eligible for Bed? would u please say me, if the d.el.ed application form will be release on may last week, then when'll be the entrance exam held...???? would u plz say, how many seats are there in odisha d.el.ed(ct) course for 2016. Approx 6 thousand seats are there.. Diploma students are not eligible..
Sir I am sikhni gender female and I got 46.66%. Can I illegible for ct entrance. dont know what you are saying.. if you are reserve category sc/st/ph then you are eligible for GEN/OBC It required 50% Marks..
OBC category is not reserve..
sir when will the B.ed notification out. Dear Sir, i have 43% in graduation and also reserve category. after ct can i eligible for b.ed. Govt.of odisha has declared for diploma in civil engg. equivalent to 2scince stream notification no-3302 dt-25/06/2014 but i m a diploma holder(75%)secured is why not eligilable for ct entrance. yes. but for CT it required +2 Qualification as per last year notification. 50% Marks required for OBC/SEBC/GEN Candidates. sir last year OBC was belongs with reserve catagory.but this year why OBC not belongs to reserve catagory? yes reserve category but Required %Mark same as General. I have 6.63 CGPA aggregate in B.Tech MECHANICAL ENGINEER. I AM INTERESTING IN TEACHING LINE. MAY I ELIGIBLE FOR BED? AND I HAVE SECURED +2SCIENCE IN 66.77%. MAY I ELIGBLE FOR CT. CAN I APPLY BOTH CT AND BED COURSE?? Yes you are eligible for Both C.T & B.Ed. According to you, online application will be release on last week of may.if we consider with previous your,this year is very late.would you please say me why does this year so late...???? Due to Late Publication of +2 Arts/Commerce Result. Dear sir listen to me aggregate of 50% marks means including 4th optional or excluding 4th optional. I have secure 47.77% excluding 4th optional and 50.77% including 4th optional belongs to OBC catagory. Can I apply ct entrance??? Sir i am complete my post-graduation this year but my result is not declared.Sir can i apply for M.Phil degree? Yes you can Apply. Certificate is required at time of admission. would you plz say me , when OTET requirement release? In July OTET Notification will out. would you please tell me? can I eligible for CT ENTRANCE 2016, Can I belongs to PH catagory? Yes you are eligible. PH Required % is 45. All the Best. i have completed my 2yr diploma belonging to OBC category. Am i eligible to sit for CT entrance exam ??? kindly respond to my query. Diploma Students are not eligible for CT Exam. it required +2 Qualification. Iam bsc graduate with 49% mark and OBC caste.can i eligible for State Bed? Is the OBC or any other cast certificate mandatory to take admission in Bed college. Yes Mandatory if you want to take admission against Reservation like SC/ST/OBC. Sir I have 50% marks in +2 . I'm obc category,can I apply ct. Respected sir can i know the publication date for bed entrance exam..for 2016.please? & Sir my graduation mark is 55% with distinction can i eligible? please reply me? Yes You are eligible for BED Exam. Apply & Notification Date will Out Soon. Most Probably this Month Last/ June First. What is the eligibility criteria for b.h.ed. Graduation with Hindi As a Subject. I have done BA with History Hon. & I have appeared in P.G. (History) with my Final Semester. Suppose I am giving the entrance test for B.Ed. & I am securing the marks in entrance test for selection for Admission in B.Ed.. So I shall have to submit my Migration & CLC certificate during the admission in B.Ed. or Not??? Yes CLC Needed at the time of Admission. Dont worry it will take some time. First Entrance will held. after that admission. Dear sir listen to me,50% in aggregate means excluding 4th optional 50% or including 4th optional 50%. I'm b.sc graduate.Can u suggest me which book/guide is suitable for the preparation of b.ed exam? there are lots of books are available in market buy anyone then start prepare.. I have completed ct with 83% marks. Can i eligible for B.Ed. Respecte sir I have completed ct with 83% of marks. Can I eligible for B.Ed. N when B.Ed formfillup date declared..
yes you are eligible... Dates & notification will available soon..
Helo sir i am punyaprava sahoo.sir resently 2016 i am qualify 2 science & i have 57.3...% can i apply CT entrance.my category. obc. plzzzz tell me sir. yes you are eligible...and you can apply..
sir,I am 3 student in pass. 55.92% can i apply b.ed. or apply only honours students?? Sir can I give both bed and B.H.Ed entrance.and I have hindi elective subject in BA second year.so m I eligible for the B.H.Ed entrance exam. yes you can give both exam..if you have 50% mark in your graduation..
DEAR SIR,IS THERE A POSSIBILITY OF OPENING B.ED COLLEGE IN BHADRAK DISTRICT LIKE SAILABALA COLLEGE? Dear sir, Good afternoon. I am Tikina Moharana 22yrs old. I have 53.83% mark secured in +2sc and 79.16% mark secured in matriculation. Can I apply it? When declared CT Course Details and entrance? detailed notification will out after +2 arts/commerce result. and you are eligible..you can apply..
its under construction..will out soon. I am b.tech in IT can I apply??? scertodisha site does not open.how to apply online application? yes you are eligible.. dates will out after +2 arts & Commerce result..
Am i eligible for CT exam.i got 45% mark in science.im a SC category student. Sir I secured 43% in BA and Applied for Rehabilitation Assistance Scheme after the death of my father who was a teacher should I pursue BEd Now? Respected sir,i am bsc graduate with 45% mark,can i eligibale for ct entrance exam.iam belong to obc caste. SIR,I"ve secured 51% in chse.can i eligible for CT? sir i am a bcom graduate ...can i apply for bed ???? last time b.com graduates are not eligible for B.ed. May they Include B.Com this year in B.Ed. Wait for its official notification which will publish soon. Sir I have done bsc .can I apply for B.Hed?? only those have hindi as a subject in graduation they can apply. ct online from stat date..
50% mark required in aggregate. Sir why site is not opened for apply in ct entrance? ?plzz tell the site in which I can apply for ct entrance? ? sir, my 2 is 60% n now my bsc is going on.can i apply for ct? if i crack the ct entrance n i want to go through ct..after this can i give the bse final yr exam or not?? no you cant give B.Sc final year exam. because in CT Admission they need your CLC and TC Certificate. yes you can apply for ct exam..
DEAR sir i'm a graduate and passed this year47% of mark and also a pol.science student i archives 51% in hons can i apply b.ed .I also reserved from a obc category plz suggests me. 50% mark required in aggregate not in Hons. i m female student form obc caste.having 63% in 10th,42% in +2 science, 48% in +3 arts ,plz sir replay me, m i eligble for b.ed entrance or not ? Sir please tell me previous year cutoff mark for SC category. Sir please tell me exact date of apply d el ed entrance..? Respected Sir,when on line application form will be available for 2016-17 Bed and CT exam to apply ,Please replay. I have completed B.A. in Economics and secured 75.62%. In Honors i achieved 78.63%. Can i apply for B.Ed?